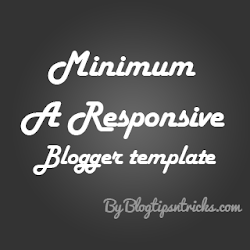 Click the Browse button and locate Minimum a Responsive blogger template. Basic Steps : These are basic steps you need to follow for each customization. You can add custom buttons in three different sizes. To add it copy the button codes as per your need. Now paste the code where you want to add the button and Replace the highlighted code with your link and button text. Please Don't Re-Distribute or host this Template any where! + Fixed Sidebar overlapping error and small bugs. how to add related posts bro?? i want to add that widget.. please help..
To Add email subscription form replace the following code with the subscribe button code. Note:- don't forget to replace chaneepsblogtips with your feedburner ID. Then to add the image thumbnails. Now Change "no" to "yes" And save your theme. Adding the email subscription changes the text and form alignments..can you please tell how to align it in a single line..
Hey zaten e-posta üyeliğim var. Hi , Is it possible to make the header fixed like sensational theme. what' wrong with the sidebar ?? To add the image thumbnails. Amazing template, just need help in one thing...i want to know code of this template's jump link theme (Read More). Sorry, I designed it only for automatic read more script. hey bro how can I change menu bar options and links?? I like your work wish you all the best. and add a author bio at below each post. and want to make comment box like yours.???? The comment form for this blog is designed for this blog so sorry I can't give it. I am wating for your answer. Pretty slick blogger template. No wonder the design is awesome since it's inspired by Minimum Child Theme, a WordPress theme by StudioPress. How to change your images of facebook - google - Pinterest and twitter to another ? Below that you can find the CSS code for the social icons. Replace the background images URL in the CSS with the your image URL. Awesome template am going to use this for my blogger website thanks for the share. I signup for subscription but I didn't got any password. How can I download the template? please provide me a password to download template. you can find the password in the confirmation mail send to you. Thanks I got that. :) but getting below error on uploading template. Is there anything wrong with the template? you've to unzip the downloaded file and upload the xml file in it. Bro, But i Loved yours Blogger Footer Subs... Widget So, I can i get the Codes ? ?, Even It Suits On Mine Blogger So Can Bro, plz plz plz !! I Request !! Sorry, It's specially designed for this blog. So Can u give me the Link Of Another Website Provide Steps For .. The Footer Blogger Widgets !! Great day sir. Thanks for sharing this template sir. I really like this. Is there a way to edit the default header of the template? Coz I like to put some logo on it. Can you help sir? How do you make the comments and social sharing buttons visible? The Get free Updates Bar and the Cool Large Social icons. Can you make it as a widget so that I can add it. Please..
Is there any way to show ads on home page between the posts..
Nice theme, but after enabling blogger post snippts, how to add margin on every side of image ?? on right side of image, it not looking well without margin. couldn't find on google. Just published template here http://getlifetipslab.blogspot.com Test Blog. I just want to know if it is possible to adjust "Get Free updates" part in the template.I want to know is it possible to make it compact in size adjusting height and font. Get Free updates font to medium size and make subscribe button font small and button medium size.Everything else works fine and good.Please help with this.Hope you reply soon,thanks for wonderful template. Below that you'll find font-size: 48px; now change 48px with your size. Below that you'll find font-size: 24px !important; now change 24px with your size. Hi Chandeep, the 'Enter Pasword' button is not working. i click the button but nothing happen. still cannot. i use chrome and IE. is it poop up?? It works on both browsers. :) Yes, It'll pop up like an alert box. if you can't solve this problem, Kindly mail me a copy of the template and list of links you want to show on the header menu. Really nice template - thank- you! One question - for some reason there is a nag bar and blogger attribution right under the "get free updates" panel. I can move or delete them on the layout section. Not sure why they are showing up at all. any ideas?? To Remove the Attribution, Search for Attribution1 in the Template code. Hi, The Code you looked is the correct code, you have to change the image there. I used CSS Sprites to increase page loading. Hi, I'd like to know if it's possible remove from the template "Read More" button in order to show the full post in main page. sorry, We can't. It may affect the page layout. I have some problem in setting up this template. 1. how can show the posts in both sides in home page. I know others may have this problem too. Please provide me some solutions with coding format. Again, thanks a ton for sharing! I'm on holidays now and I cannot check this but sure I will do when I'll be back. it worked wonderfully. Thanks a ton again!! Hi Chandeep this is a fantastic template thank you very much! I was wondering how do I delete the post header in my posts. I literally just want to hide the part that says "Posted by". To make it add the following CSS code in the template. I was trying to upload "Minimum A Responsive Blogger Template" but couldn't.. there was an error message..
1. Download a template file (Zip / Rar) from blogtipsntricks.com and unzip files on your hard drive. 2. Log in to Blogger Dashboard. 4. Click on "Backup / Restore"
5. Important!!! :- Backup your old template by clicking on the "download full template" link and save the file to your hard drive. 6. click "browse" button, Find and Upload the new Blogger Template. With that said, please allow me ask these questions. but I can't seem to find the form code to change it. Also, is there a way for me to omit or how to omit this "Powered by Blogger" found on top of my featured social profiles? Then To Remove the Powered by Blogger Search for Attribution1 in the template code and remove the entire widget. Hello ! Amazing design. Love it! Downloaded it! Cannot install it :*( and want to cry. I keep searching for the "More Options' tab on my Dashboard and simply cannot locate it. I even tried switching to the Old Blogger Design to attempt addressing the problem, but alas, no success. when i tried to upload the template i gets following error message. what do i do bro? Is there a way to add pictures to the posts on the homepage instead of titles only? how do I add other links, cascading link in the header? Make a drop down menu. Under the link "Arrivals" for example. Thanks for your great template bro.. I Really like your template. I use for my recipes blog. 2. I added the background color to the Main Menu Navigation Bar but it is not stretching itself to the screen width. check this background of navigation bar is ended with the margin from both side of the screen on the other hand subscribe box is fitted fine. 3. Is there any way to make the thumbnail of the posts round or circular. Thank you very much Chandeep. Please visit my blog at http://www.blogforguest.com/ and tell me that how can i increase space between navigation bar and archive's title because title is little bit mixed with navigation bar. Please can you have a look and recommend a way to resolve it? Search for ".sidebar ul li"
Please tell me that how can i make my home page as you have on your page , single post in each line without pictures becaue I don't have pictures in many posts. Also please check my blog http://blogforguest.com and tell me how can i add space between POSTED ON and date becaues you can see that date is merged with text POSTED ON. How can I change "" icons? How can I change Social Profiles icons? 2. Scroll down then try to find something like this --> url("http://.../icons.png"). 3. Copy and open the link, then save the dedicated image. 4. Edit in says..photoshop and save it in .png format. 5. Then upload in your blog as a entry. View the post. Right click to the image and choose 'View the image." 6. The browse will give you the generated link. 7. Copy the link and replace the original url. the problem is, i cant download the image. found the link from CSS but when we paste on browser, nothing appear? why is that so. Can u help me? I want to use this great template in my blog. Since I subscribed. How do I get the download link now? thanks for your beautiful template .. i am really loving it ....can tell me how can i add email subscribe box and related post just like your ...please help me ... thanks ..!! my home page show only 3 post and next page counter not working... my blog is www.templateforrest.blogpot.in how to resolve it please help! How can I add my mailchimp link to the subscribe button? Can you please provide me icon for linked in also? problem 2 the Posted On in the post will not shoe the date? hmm Its correctly enabled in the set up for post in the layout. What is the best size for the images? The ones in my blog aren't fitting well. There isn't any need to resize the image. Can you explain the problem? In the header, the title and the other text, the "ă" character is displayed with a different font. Similar accent characters, or diacritics, are displayed differently also in posts. Help me please. Solved, the link from google fonts must include the "latin extended" subset in order to display diacritics. Btw you must add amp; after & in the link, to make it work for blogger. Very beautiful template, may be I will use this template if i create new blog. How can I displaying the thumbnails from external images link? I add external images to my blog posts, then media thumbnails are not present. download link of the template is not working ? Hi, love the template and have managed to change almost everything I wanted, but how do I insert an image or banner on the main page, after the subscribe banner? Is there any way to add a YouTube button. I wanted to replace Pinterest with YouTube. Thanks Chandeep. This is awesome! We use it on our blogger help guide blog. i have applied it to my blog wordofthday.blogspot.com and it is looking amazing. Wordpress is most popular CMS platform with user friendly interface and customization option. You can consider hire wordpress developer to create stunning website for your business.